iP-Solutions has been established as a high tech business of a new generation to specialize in intellectual property (IP) development in the GNSS area. iP-Solutions is suppling its users with GNSS instruments since 2007. Among our users are JAXA, NASA, Spirent, Thales, Mitsubishi, NTT DoCoMo and others. Members of our staff have more than 25 years experience in the GNSS field. We are a team of scientists and engineers working together since 2007. We concentrate our efforts primarily on three main areas: software receiver technology, instant positioning, and GNSS simulation technology. We have vast experience, know-how, and IP in such areas as digital signal processing, acquisition and tracking of GNSS signals, and more. Some members of our team have more than 30 years of GNSS applications development experience and numerous awards from prestigious professional organizations. 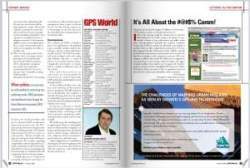 Since 2004 our principal engineer is on the GPS World Magazine Advisory Board. For more information on our IP, please see our books, papers and articles published by leading professional magazines and journals.